The phrase "How do you eat an elephant" has been in our minds! One bite or step at a time. I think we have finally come to terms with the fact that we are not as young as we were and being in our fifties our bodies are taking longer to adjust to the daily tramping than we thought. So we have had a two day break at Pakiri Camp with Graeme and Sandy Ruth who we used to work with in Hanmer. It is a beautiful spot beside the sea and the weather has eased off. We have had an awesome journey to get here from Tidesong on the Taihururu Estuary. Thanks to Sam Palmer's Uncle Chris and Donna for looking after us and organising for us to stay at the Ocean Beach Life Saving Club after we had walked over the Kauri Mountain and along the stunning Ocean Beach. 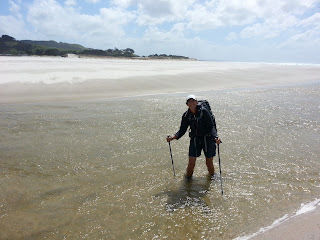 The next day was another steep gnarly track over the Whangarei Heads, it was a 7km track and took 5 hours to walk!! At the end we went off down for a swim at Smugglers Cove which was refreshing to say the least. The next day in the Te Araroa notes tells you to hitch a ride across the Bay with fishermen. That seemed a bit too risky for us Brodies, so we organised a trip with a guy who crosses everyday, unfortunately he forgot about us !! So we went to the marina and waited for the fishermen and literally hitched a ride!! The guys were a bit reluctant at first but ended up taking us right into the new Marsden Cove marina. We were off route a bit so thanks to Hope from the Marina cafe who took us to the start of the beach walk. The walk along the beach was magic, the weather was beautiful and the river crossing was not deep so we pressed on to Waipu - the town with Scottish connections and their own highland games. We were overwhelmed at the pub when a lady who had seen our charity sign gave us a $10 note and wished us well. We have heard so many stories of families affected by cancer, it is such a huge issue. To avoid a closed track we walked to Waipu Cove which is a surfers haven and then up and over Mangawhai Heads - a stunning track along the ridge and down to the beach. We continued on to Riverside camp ground and a warm welcome from Maree, who on hearing our story donated a night in a caravan to the cause - Many thanks guys. The bad weather hit us the next day and the only saving grace was that the wind and rain was directly behind us and we virtually flew along the beach over Te Aria bluff and onto Pakiri. At lunch time we had a wonderful text from Sandy to tell us she was cooking a roast and a big pudding and to keep smiling !!! About 2 km from the campsite the sun came out and Steve suggested we took off our wet weather gear, however I was too tired to do it and he had to do it for me - I had hit the wall!! We have had a well earned rest here with Graeme and Sandy and a night of luxury in one of their beach front units. Again thanks guys for all your help it has been great catching up.